The big three TV manufacturers have released their top teles, but it's Samsung's future-proofing that will win out. Our lovable TV guru, John Archer, has cast his well-trained eyeballs over the latest flagship TVs from the big three manufacturers; LG, Samsung and Sony. Interestingly all three have taken rather different views on what it thinks constitutes a top-end TV, to varying degrees of success. LG, as it's wont to do, has focussed on the unashamedly beautiful OLED panel as the thing to build its top teles around, Sony has taken the 'bigger is better' mantra to heart in both screen size and aural experience and Samsung has strapped on its tomorrow goggles and tried to make the most future-proof TV around. OLED's too expensive to produce in large numbers though and while super TV audio on a big screen is nice, it's certainly not a must-have option. For our money then - and with these screens we're talking LOTS of money - it's Samsung that wins hands-down despite an industry going ga-ga over those organic light-emitting diodes. The big thing about the OLED tech is that it contains self-emitting diodes, as opposed to the standard LED technology which requires panels to have a back-light behind them to increase brightness. That means it can be super-slim and far lower-powered than the standard displays, and can also be used in a future of flexible screens too. The top-end LG 65EC970V then comes in a beautifully-designed chassis and packs image quality to make you slack-jawed...for the most part. The contrast is stunning, letting deep black pixels sit cheek-by-jowl with bright whites. But for all the contrast and bright, vivid colours it's not perfect. Inaccuracies are visible in flesh tones, leaving them a little patchy and you can also see odd colour tones appear across the screen too. And if you push the brightness setting above 50% suddenly that impressive contrast vanishes and you're left with a panel that's blotching-out. Sony though has eschewed the temptation for new screen tech and is betting its house on the Triluminous technology, a huge 4K UHD panel and aural performance to make your ears happier than a hippy in a hay field. The enormous Sony KD-75X9405C then is one imposing TV. It's also capable of some almost OLED-rivalling feats of contrast performance, delivering a cinematic feeling to any scene you put its way thanks to Sony's mighty image upscaling technology. The Android TV smart system too may not be everyone's cup of tea (certainly not John's…) but it's functional and is only likely to improve. What also makes this massive TV so vast is those 'Hi-Res Audio' badged speakers arrayed either side of the screen. They're capable of delivering quality audio that would make any sound bar weep. But it's Samsung's smart focus on the future of home entertainment that makes it's SUHD screens stand out from the rest. 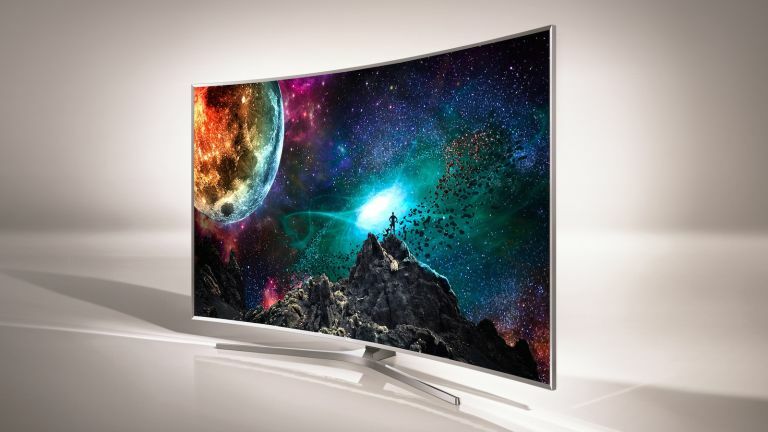 The Samsung UE65JS9500 is simply the finest TV of this - and probably any other - generation. Not only is it packing in the 4K UHD resolution into its panel it's also using its Nano-Crystal technology to increase the set's colour range. This is effectively Samsung's version of the quantum dot filters other manufacturers are using and happily boosts the colour gamut. The big ticket for the UE65JS9500 though is the inclusion of support for high dynamic range (HDR) content. Although the standard hasn't been 100% finalised yet, the Samsung has all the necessary requirements for making the most of HDR. Which is to say it's rocking that wider colour gamut, unprecedented brightness levels and some serious contrast performance too. And that all makes HDR content sing. The problem is this whole chicken/egg thing, where folk like Netflix and Amazon are still holding fire on a full release of HDR content until more TVs support it and thus make it a viable expense. But Samsung has gambled on getting it into its flagship TV right now, while the likes of LG and Sony are talking about possible firmware updates. Possible, perhaps being the operative word. LG may not actually be able to update its OLED screens to cater for the eye-catching HDR tech. And once the Ultra HD Blu-rays get a full release at the end of this year - with ratified support for HDR - we'll start seeing proper 4K HDR content shipping and the only screens prepared for that glorious future are Samsung's. The UE65JS9500 also cleverly packs all its processing chops into an external One Connect box. That means even when new processing techniques turn up, making the current setup seems second-best, you can simply swap your current box for a new one and still make use of your beautiful Samsung screen. Sammy's got this one in the bag, then.